Help Animals Asia Rescue Bears In Disgusting Conditions – Please Donate – Link Below. – see Donation link below. He’s rescued hundreds of bears from bile farms but, for Animals Asia Vietnam boss Tuan, those still caged and suffering never leave his thoughts. 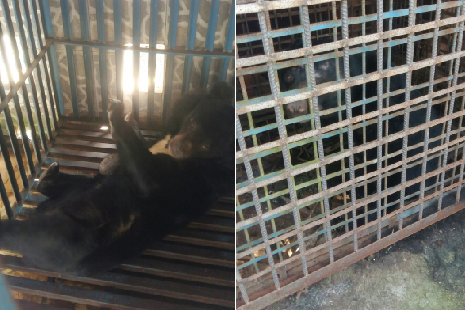 In 2011, an Animals Asia team was in Vietnam’s Gia Lai province to rescue a sun bear from a bile farm. As is always the case with bear bile farms, the animal, now known as Nelson, was kept in appalling conditions. 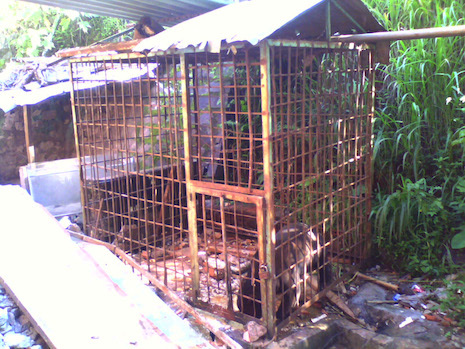 Animals Asia’s Vietnam Director Tuan Bendixsen remembers the tiny, rusting cage that had held Nelson for his entire life (pictured below). Bear farms take their toll in myriad ways. Nelson’s teeth were shattered and infected from desperate attempts to chew through the iron bars, while the surface of his eyes were scratched affecting his vision. Over 11 years rescuing bears from the bile industry, Tuan has no shortage of bad memories. He knows better than anyone what bear bile farming looks like: hopeless, fearful eyes, balding skin, open wounds, malnourished bodies and shattered teeth. So when local Forest Protection Department (FPD) officials told Tuan there were more bears being held in the province, he knew he had to act to spare them the horror he had seen repeated elsewhere so many times. That day he made them a promise: if you can convince farmers to give them up, we can save the bears – anytime and we’d be back. That pledge was vital. Vietnam’s Forestry departments are woefully under funded. If they were to find evidence of bear bile extraction they would most likely be forced to turn a blind eye. They simply have no facilities to care for confiscated bears. Tuan’s promise changed all that. It empowered the FPD to go after those farmers, watch them closely for any mistakes and convince them every day that there is no future in the cruelty of bear bile farming. This month, more than half a decade later, that pressure looks to have paid off as hopes grow that these bears (pictured above) can finally be saved. “For five years I’ve known these bears were suffering unimaginable torment. Underfed, unable to stretch their bodies, sickness, pain and mental agony. We’ve seen it all before, but I know when I set foot on those farms it’ll be as horrific as the first time. The disgust of bear bile farming never dulls. The bears you can’t rescue, haunt you – they’re never far from your thoughts.